Cherry and Spoon: Fringe Festival 2015: "The Sound of Footloose: The Not Musical"
Fringe Festival 2015: "The Sound of Footloose: The Not Musical"
Summary: A silly and fun mash-up of two classic movies - The Sound of Music and Footloose. Highlights: This one is totally frivolous but kinda fun too, even if the premise is a bit confusing (how is it the '80s and yet still someone pre-WWII?). I can't resist a SoM reference, and this show has them aplenty, from lonely goatherds to packages with strings. Several of the songs are worked into the dialogue and the '80s song parodies played during the fun dance sequences (choreographed by Windy Bowlsby). The story finds novice Maria a rock-and-roll loving (in the '30s?) 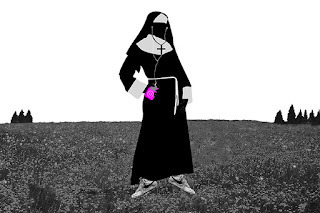 nun sent back to high school to keep on eye on the Mother Superior's rebellious son (she wasn't always a nun), and pleads with the Nazis to allow them to hold a dance that will save Austria... or something. It's pretty goofy and mindless, but the cast is totally committed to the camp of it all. But I'm not so sure about the "not musical" declaration; anything that includes a dream ballet is a musical in my book.